The game starts and the pattern is immediately different from Sunday against Man City - where Saints had struggled to get out of their own half in the first 15 minutes against City. They find it much easier to get a toe hold in the game here and are able to take the game to Arsenal. Not that Saints have it all their own way, but at least this seems more like a game between 2 teams at similar levels. Arsenal create the first half chance, as Welbeck is put through in the left channel, but Forster is quickly out and does what he’s very good at - being imposing when a striker goes through. e is reminiscent of Peter Schmeichel at times, and intimidates Welbeck into shooting wide. Saints respond well as Pellè creates our best chance of the half, a lovely 1-2 on the edge of the box putting him in and an opportunity to shoot from an angle. However, perhaps his confidence is not what it was a few weeks ago and he slashes wildly, hitting it well over the bar. He generally looks lively throughout the first half however, putting himself about and causing problems with his movement. Wanyama is particularly strong in the early exchanges, and Ian Darke and Michael Owen speculate that he’s just the kind of player Arsenal could do with - I doubt Arsene Wenger would agree, but most neutral observers would see their point. As Owen says 'It’s a long while since the days of Vieira and Petite [sic]' - Emmanuel Petit might have had long girly hair, but I don’t think he’d appreciate the feminine form of the word. Vic then knees Cazorla in the groin to prove who is in charge of the midfield here. It’s 25 minutes until we see anything of what the old Arsenal are good at, an intricate move ending with a low shot from Oxlade-Chamberlain that Forster gets down well to save. However, Saints are generally comfy until Cork is forced off after taking an early knock and Saints make the same change as against City, with Yoshida on and Alderweireld going into midfield. Toby’s classy reading of the game is still of use in this position, but he’s not as dynamic as Schneiderlin and goes into the book for a mistimed tackle on Sanchez. The commentators note how quiet the Arsenal fans are as a half of few chances draws to a close, ending with a long range Pellè shot after Wanyama won the ball in midfield, then a fine Forster tip over after Welbeck’s header. 0-0 is a fair half time score, and a nice confidence builder for Saints who have shown that they are up to the challenge here. The second half starts with both teams struggling to get behind the other defence, chances limited to long range efforts. For Arsenal, Ramsey, Cazorla and Ramsey again take pot shots that never trouble the goal. Saints have a clever corner where Clyne crosses from deep to Pellè at the back post, but he is blocked before he is able to get a shot away. Then an excellent Saints break puts Long in on the right, but he shows his limitations as he shoots when a cross to Pellè was needed. Tadić is replaced by Mané on 62 minutes. It has been another unproductive game from him. Several times he got into dangerous positions, only to dwell on the ball or waste it. Saints desperately need him to re-find his form of a few weeks ago. There are 2 key personnel changes that alter this match. The first comes when Giroud replaces a disappointed Oxlade-Chamberlain. Giroud is a constant menace to Saints and is crucial in causing different, more frequent problems to our defence. He is immediately involved as Arsenal go up a gear - Forster makes a good parry from his shot, and Welbeck can’t quite get a shot away from the rebound. Then Giroud’s flick finds Welbeck who forces an outstanding reflex save from Forster - Giroud nearly gets on the rebound before it is smuggled out for a corner. Pellè is less involved in the 2nd half as Saints appear (sensibly) to be happy with a draw. Our breaks are becoming less common, Mané blazing over from distance. Then the 2nd key change, Mayuka replacing Long. Key, because moments later Alderweireld damages his hamstring and has to go off, leaving Saints with 10 men. Saints are put right onto the back foot, trying to cling onto the point, and ultimately the pressure tells. Giroud looks to have scored with a header from a deep cross on 87 minutes, but Forster makes yet another superb save. Then Arsenal strike. Fonte might concede a penalty for handball, but the ball falls to Ramsey, whose low cross is swept in by Sanchez. The final minutes are played mainly in Saints box, as Arsenal might easily get a 2nd goal, chances for Giroud and Podolski going begging. Cruel stuff. We defended solidly, Fraser Forster in particular must have answered some doubters with a superb display, he made a number of terrific saves to keep us in the game. Was it an unfair result? A critic could point out that Forster was man of the match, Martinez meanwhile didn’t have a save worthy of the name. 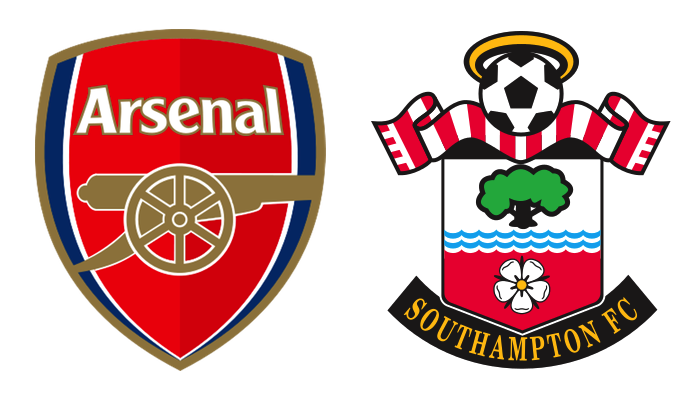 But still, Saints set themselves up very well and kept Arsenal at arm’s length up until the introduction of Giroud, at which point we dug in for the draw and nearly got it.